What many spectators expected to be a lecture in Room 26-100 last Tuesday evening by author Susan Sontag turned out to be a surprise visit by English author Salman Rushdie. Rushdie has been living in hiding since a death sentence was issued against him on Feb. 14, 1989, by then-Ayatollah Khomeini of Iran for his book Satanic Verses. Currently, there is a $2 million reward for Rushdie's death, Sontag said. "We are privileged to host this distinguished speaker," said Provost Mark S. Wrighton as he presented Rushdie with a citation and named honorary visiting professor of the humanities. "We honor him, and we celebrate our freedom of expression." The citation given to Rushdie cited both his literary ability and his struggle against terrorism, recognizing his "outstanding contributions to world literature" and his "independence of thought and expression". Professor Alan Lightman, head of the Program in Writing and Humanistic Studies, gave the first official indication of an unusual visit. "In a few minutes we are going to be joined by another honored guest," he announced at the start of the lecture. "For security reasons, I ask that none of you leave the room until the event is over." Nobody departed as Susan Sontag took the stand. "First of all, I want to speak about a friend of mine -- the great English writer Salman Rushdie," Sontag began. She discussed Rushdie's plight and the need to stand up against terrorism. "What Salman Rushdie stands for," Sontag said, "is the right to secularism, pluralism, freedom of expression, tolerance -- values that I hope we are all united in supporting." "That [the discussion of Rushdie] is the first thing I wanted to do this evening," said Sontag. "And the second thing, not surprisingly, is I want to introduce Salman Rushdie." Rushdie then walked out upon the stage to a sustained standing ovation. Wrighton presented the citation appointing him honorary visting professor of the humanities. Because MIT does not bestow honorary degrees, the visiting professorship is an unusual honor. Previous honorary lecturers include Winston Churchill and philanthropist Cecil H. Green '23. Rushdie is the first honorary visiting professor. "It's something that's just created for very, very special situations," Lightman said. In his lecture, Rushdie expressed hope that his visit to MIT could be "the beginning of a long-term relationship with this great institution." 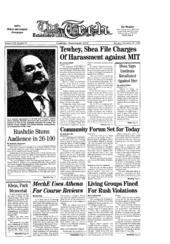 Rushdie was heavily guarded by over 20 State Department agents, Campus Police officers, and Massachusetts state police. Rushdie began by apologizing for the "cloak and dagger" approach to his appearance and thanked Sontag for acting as "my beard." The MIT appointment, he said, was "the first academic honor I've ever received, so it's nice to start at the top." Rushdie briefly discussed censorship and the death threat against him, his translators, and his publishers. He said that the shooting of his Norwegian publisher makes him feel "determined to try and make sure that this is the last such atrocity. And for that, I'm afraid I need your help, because the only weapon that I have is public opinion." Speaking against the "remote contol" terrorism used against him, Rushdie said that "if this form of terrorism seems to be working, it will be repeated." The only way to stop terrorism is "to say `I'm not scared of you.' The purpose of terrorism is to terrorize. The only defense against terrorism is to refuse to be terrorized," Rushdie said. Rushdie then turned to reading several excerpts from Midnight's Children, a novel about a young, telepathic boy growing up in newly independent India. Lightman described the 1981 Booker Award winner as "a masterpiece of world literature." Last year, Midnight's Children was selected by the Booker committee as the best English novel of the last 25 years. Rushdie also read from a short story entitled Christopher Columbus and Queen Isabella of Spain Consummate Their Relationship -- Santa Fe, 1492. At the conclusion of the lecture, Rushdie received another standing ovation. Lightman detained the audience several minutes to allow Rushdie time to safely depart. In her introduction, Sontag spoke of Rushdie as "only the most visible individual victim of a worldwide struggle against tolerance," citing other examples of oppressed or threatened authors. Sontag tied Rushdie's situation to the plight of the Bosnians -- she was recently named an honorary citizen of Sarajevo after staging a production of Waiting for Godot in the besieged city. Sontag said that terrorism cannot be allowed to affect society, that "those who would silence honesty, and silence dialogue" cannot be seen to be succeeding. "The worst kind of censorship is self-censorship," she said. "[Rushdie's] case is a great test of where we stand on the issue of freedom and solidarity and the future of our culture." Following the visit to MIT, Rushdie met with President Clinton on Wednesday. According to The New York Times, the White House wanted to "convey America's abhorrence of Iran's refusal to lift the death threat against the novelist."